THE University of the Highlands and Islands has opened a microcampus at the Hunan Institute of Engineering in China. University of the Highlands and Islands principal and vice-chancellor, Professor Clive Mulholland, and Hunan Institute of Engineering President, Liu Guofan, marked the opening with the unveiling of a plaque. Professor Stuart Gibb, the university’s vice-principal international and external engagement, also attended the opening along with Perth College UHI principal and chief executive. Margaret Cook, and her colleagues, Veronica Lynch, vice-principal (external) and Lin Shen director of partnerships – China and South East Asia. The launch event took place on Monday 5 November, the day of the engineering students’ graduation. 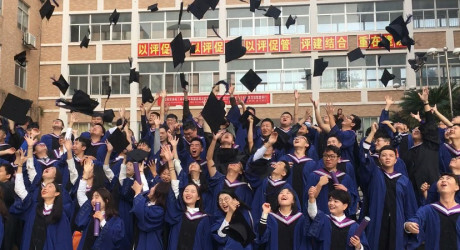 The ceremony, held in the city of Xiangtan in Hunan Province, southern China, saw 90 students graduate from all over the country. Five students had completed their degrees with Honours by studying for a fourth year at Perth College UHI.